O. Nkanga: * 1974 Kano, Nigeria. Lives and works in Antwerp. E. Ogboh: * 1977 Enugu, Nigeria. Lives in Berlin and Lagos. 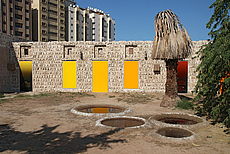 Multi-channel sound installation, sculpture and light installation, poetry. 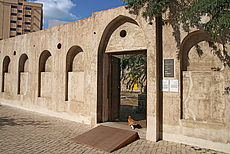 For SB14, Otobong Nkanga and Emeka Ogboh collaborate on a series of multimedia interventions in the heritage house Bait Al Aboudi and the surrounding grounds. Aging Ruins Dreaming Only to Recall the Hard Chisel from the Past explores the land, the human (and animal) body, the organic and the inorganic, the animate and the inanimate, and the visible and the invisible, manifesting an affective ecology of prosperity and depression, hopeful beginnings and eventual demise, and the possibility of rebirth. 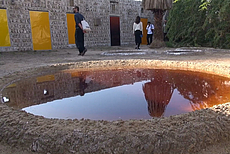 In the untended garden of this building, the artists have created several circular craters framed by sand mounds, and they have filled the craters with water brought in from the sea. 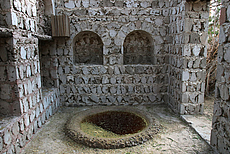 Salt has been added to ensure that traces of saline will remain as the water evaporates over time. 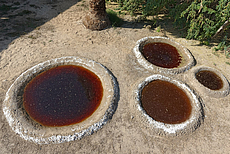 In close proximity to the craters, a number of speakers play a range of natural sounds, a recording of an Emirati ‘rain song’ performed by children in Sharjah and texts conceived from the perspectives of water, earth and trees, written and performed by Nkanga. 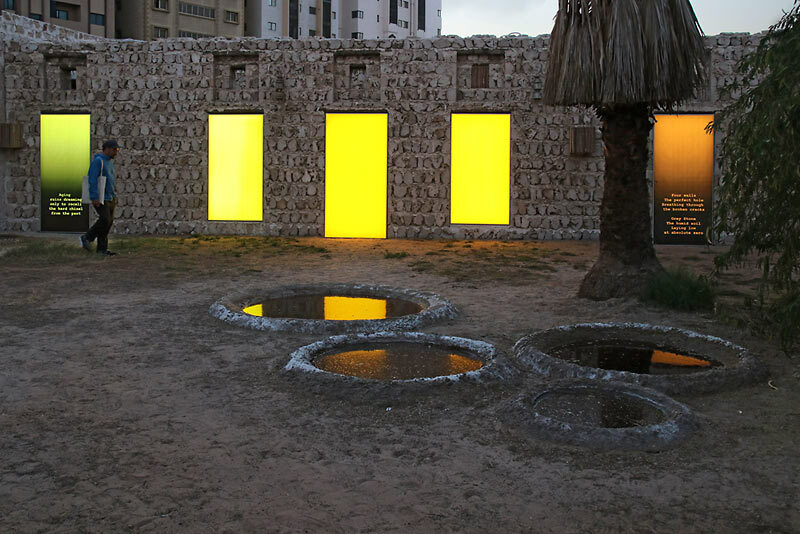 Light-boxes rendered in the tonal shades of the sunset as well as lines of poetry describe the architecture and materiality of the building. 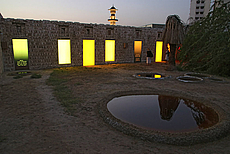 The interplay of evaporating water and waning light recall the departure of life from Bait Al Aboudi, which now stands as a ruin, while simultaneously imbuing the courtyard enclosure with the residue of salt, the sounds of natural elements and voices, and the gradients of the sunset that signal life’s inevitable return.